Jury selection in the trial of Theodore Wafer is set to begin today.2 Now is our chance to demonstrate that Renisha’s family is not alone in their calls for justice and that they have the love and support of people across the country who are counting on the Wayne County Prosecutor, Kym Worthy, to deliver justice the first time so that this case won’t have to be argued in higher court. Show your love and support for Renisha. Please share this image with your friends and family to send a powerful message that we’re paying close attention, we want a full, fair and just trial and that we are prepared to take action. 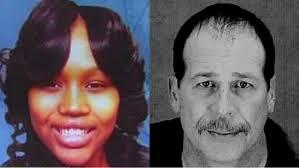 The tragic murder of Renisha hasn’t stopped calculated attempts to smear and criminalize her by Cheryl Carpenter, Wafer’s defense attorney. Carpenter recently requested a judge let jurors see photos of Renisha that show her with wads of money, alcohol and marijuana.3 As the trial gets underway this is likely the storyline that the media will run. But we can change this narrative and make it clear that this trial is not about calling up ugly racist stereotypes; its about justice, ensuring that Black lives are valued and protected, and that perpetrators who commit unconscionable, violent or deadly acts against Black folks are held accountable. Renisha’s life was cut brutally short in circumstances that have become far too familiar — a young unarmed Black person gunned down by a white person harboring dangerous racist stereotypes, deep-seated and unfounded fear and a proclivity for racial profiling.4 Renisha is lovingly recalled by her family as “a caring person who loved cars and shopping, worked for Ford Motor Co. and had aspirations of becoming a police officer.” Renisha deserves to be alive today to fulfill her dreams. And while a murder conviction could never bring Renisha back, by sharing this powerful graphic we can send our love and support to her family, loved ones and Detroit community and fight back against irresponsible efforts aimed at criminalizing and putting the victim on trial. Please share this powerful image to show your love and support for Renisha. And when you do, please ask your friends and family to do the same. P.S. Click here to download either the poster-size version or the Facebook share size of the image. Help support our work. ColorOfChange.org is powered by YOU—your energy and dollars. We take no money from lobbyists or large corporations that don’t share our values, and our tiny staff ensures your contributions go a long way. 1. 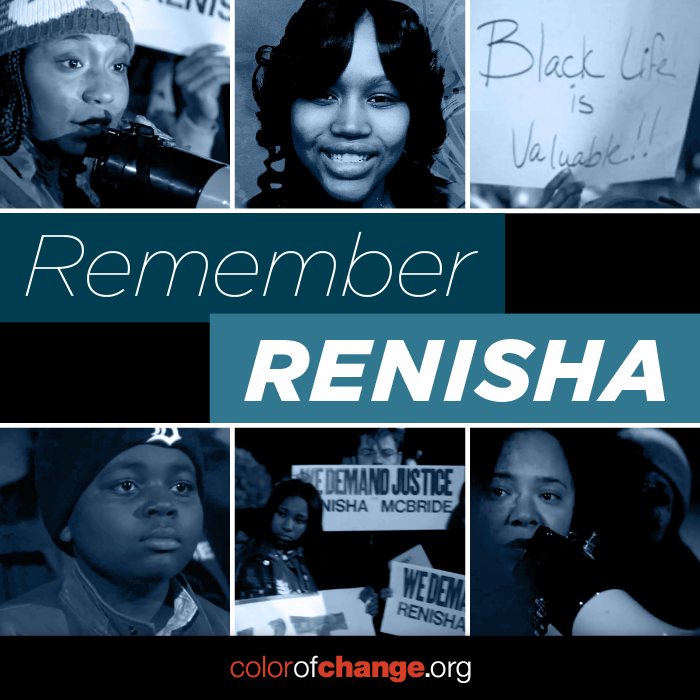 Justice for Renisha now! Hi Angela. In case you didn’t see the emails…your mic check guest post is up. It’s already gotten a lively response. Feel free to respond to comments. Thank you for inviting me to write a mic check guest post. Nice discussions I look forward to joining ….. Thanks for bringing this case to our attention! It’s definitely important that we show Renisha’s family, as well as the judge of the upcoming trial, that we demand that this trial be handled in a fair manner and that justice is done. We should have all eyes on this case and a plan of attack should justice not be served. We need to be strategic! The elections are coming up that is a starting point. We can move mountains TOGETHER. This is a perfect example of modern day racism. A thief attempted to break into a house, and the homeowner defended himself. That’s all. Now these racists are trying to spin it into a “white vs. black” thing. I hate to break it to everyone, but a criminal is a criminal, no matter what color their skin is. If someone is trying to break into my house, the last thing I am going to be worried about is what color their skin is. Renisha McBride lived as a criminal, and died as one. Still tragic though, as with the right help early enough she might not have turned to a life of crime. Teddybear192837 You are a COWARD. Show your face and real name then state your opinion as person of integrity which obviously you are not. I have done significantly more research on this case since my previous comment. I wish to rescind my statement above, as it was clearly based on false information given to me. Upon review of the facts, it is clear to me that the shooting was in no way Renisha’s fault.